Tristan Edis at Climate Spectator makes a valid point that insufficient attention has been given to the increase in mining emissions in our national inventory. The two graphs displayed represent change in emissions. To provide context we really need to know the total quantum of emissions for each category. So I looked for the source of his graphs. Turns out there is no one source. You have to go to this page. There is also a search facility here. Edis has chosen his graphs well to make the points he makes, but some of the impressions may be misleading. 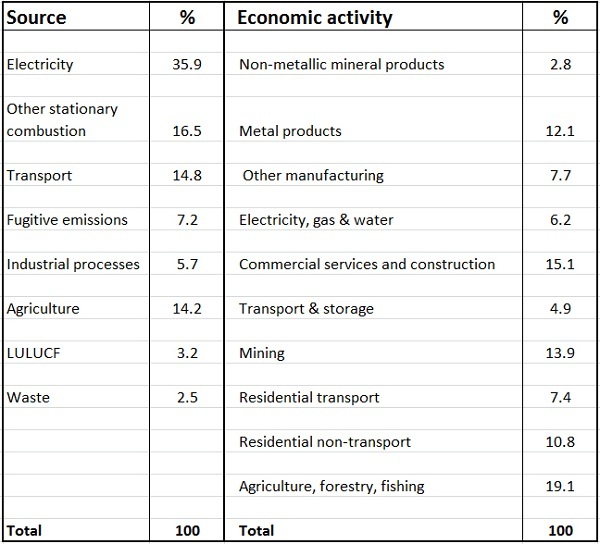 Mining is the fastest growing sector but agriculture, residential and manufacturing are all still larger sectors. And residential in his graphs is only about half electricity consumption. The other half is mostly transport, but also includes emissions generated at residences, presumably mainly from gas. There are many messages you can dig out of the mine of information provided online. I’ll try to give a brief overview here. Land use, land use change and forestry (LULUCF) activities are included. The figure for electricity needs to be largely distributed across the other sectors. 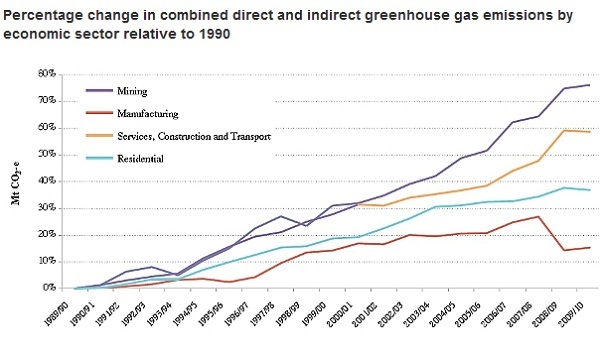 For example, the residential figure cited here would comprise only transport plus other emissions generated at homes. Given the size of the electricity sector as a source and its potential in reducing emissions in the transport sector, clearly decarbonising electricity generation would go almost half way towards achieving zero emissions. 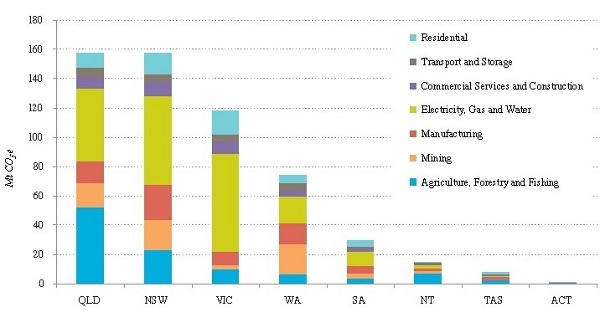 Tackling electricity generation and transport represent the low-hanging fruit. We have to ask whether an emissions trading system (ETS) by itself will achieve this in a time frame compatible with avoiding dangerous climate change. Recently I heard on Radio National that the fall in the demand for electricity is effectively locking in coal as a source of baseload power. If this article is correct we are spending $100 billion on a grid which will not be capable of handling diversified power generation. This article is one of many detailing the falling electricity demand and some of the implications. Queensland would be the champion in per capita terms. The Queensland LNP Government has decided to axe the policy and programs section of the Office of Climate Change. ‘Can-do’ can do whatever he wants! 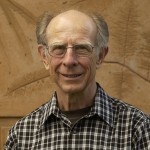 Brian: I assume that the agriculture figure is net total emissions rather than fossil carbon based emissions. Non fossil carbon emissions will tend to be part of natural cycles and there fore have not much effect over the longer term? John, not sure about what is covered in agriculture figures. Actually this was a draft I did back in May. I only put it up here to see how the images turned out. I remember not being altogether happy with the post, but I can’t remember why now! I had intended for you to look at it and perhaps do a complementary post, it being your patch, as it were. I think there is new information out now, so it’s probably out of date! John, there was an article by Marcus Priest in the AFR you might be interested in. Unfortunately the online version doesn’t carry the graphs of electricity supply by source and the future projections.